Is sipping on your afternoon cup of tea sometimes a painful experience? 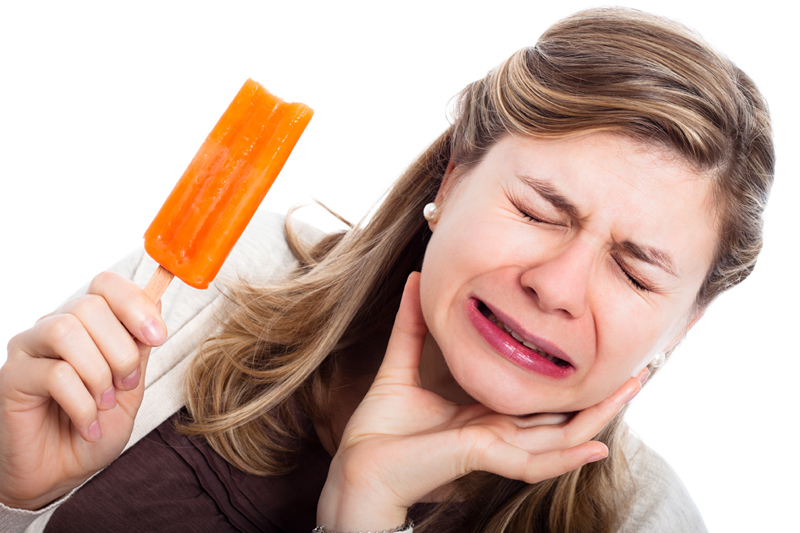 Does a bit of ice cream cause sharp pain in your teeth? Do you ever find yourself wincing in pain when brushing or flossing? If you said yes to any of these questions, you may have sensitive teeth. In most cases, tooth sensitivity occurs due to the exposure of the dentin—a part of the tooth full of tiny tubes with sensitive nerve endings. Temperature changes, certain types of food, and even cold wind against your teeth can cause sudden throbbing or stinging. Sometimes, however, other factors, such as cavity or a cracked tooth cause tooth sensitivity. If you are experiencing a relatively minor irritation, we suggest using a soft-bristled brush. Also, try not to brush the affected teeth too long or hard. Use toothpaste that contains fluoride as well, as the ingredient helps increase the strength of the tooth enamel. You can also try a toothpaste with ingredients used specifically to target sensitive teeth. If the sensitivity persists, do not wait to determine what is really causing the problem. Sometimes, tooth sensitivity is an early warning sign of other, more serious dental problems. At Danny de Villiers Dentist, we can diagnose the cause of your sensitive teeth and create a treatment plan to eliminate the sensitivity and also prevent future deterioration. There are a number of treatments available, and we can help you find whichever one will work best—depending, of course, on your situation. Some treatments may include prescription mouth rinses, fluoride varnishes, or bonding agents applied to the outer surface of the teeth. We may also recommend a root canal treatment to eliminate the problem. Note: Always seek a dentist’s help when experiencing tooth sensitivity, and do not try to diagnose the problem yourself. As we have said, the teeth sensitivity you are experiencing may be a sign of something more serious, and only a dentist can tell you what it really is.